While Google+ may be ending, Google is making it easy to retrieve information from the service and all users should have received an email giving the details of what needs to be done. The download and save links to a support page which provides guidance on downloading all your Google+ information, including photos. It’s straightforward to do, but Google does take a few days to assemble the data and make it ready for download. Google then makes the data set available for around a week. 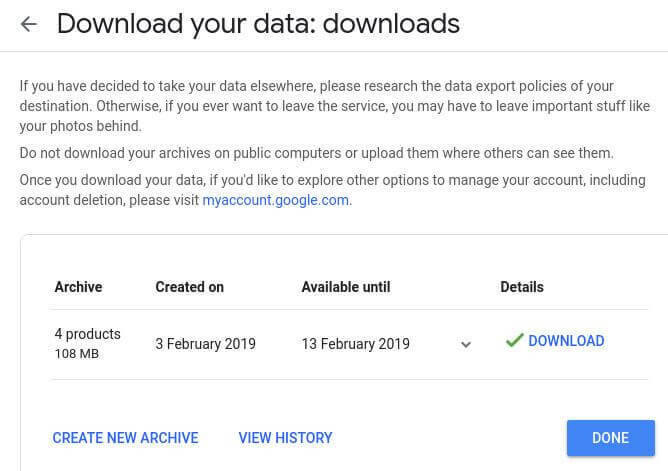 I requested the download on 3rd February and received a notification that it was ready on 7th Feb.
Once downloaded, the archive can be unpacked. Google sorts the data into folders relating to your activity on Google+ and provides some additional html files to make browsing the data a little easier. Having said that, if you are only after your pictures, a quick search from a file manager for jpg will get quick results. My online life with Google+ was quite small at 108 MB, but a friend who was an enthusiastic contributor to the server downloaded several gigs of data. While it’s sad to see Google+ going away, it’s great to see Google making it easy to retain your Google+ data.